Father Michael Habib poses for a portrait in front of the Iconostasis on Wednesday at St. Ignatius of Antioch Orthodox Christian Church in Twin Falls. The church is celebrating its 25th anniversary in Twin Falls. 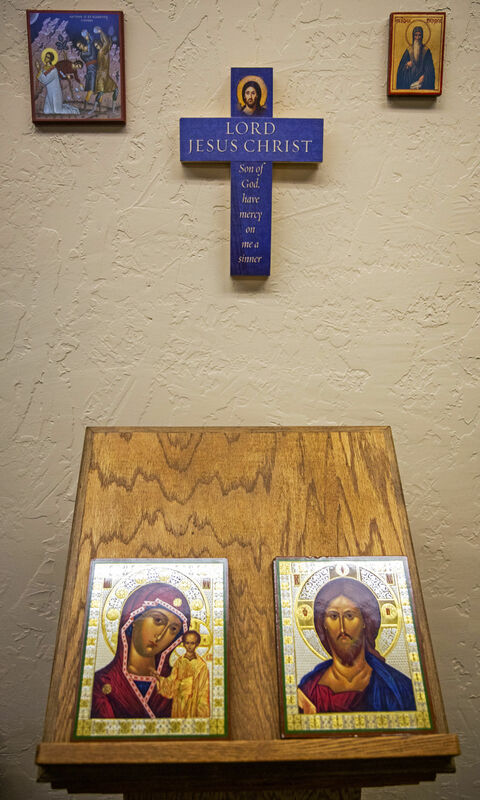 An Icon wall sits in Father Michael Habib's office Wednesday at St. Ignatius of Antioch Orthodox Christian Church in Twin Falls. The sign outside welcomes Metropolitan Joseph on Wednesday at St. Ignatius of Antioch Orthodox Christian Church in Twin Falls. TWIN FALLS — A faith not often seen in rural America has been growing steadily in Twin Falls, even as other religions have seen declines in attendance. St. Ignatius of Antioch Orthodox Christian Church first came to the Magic Valley on Dec. 19, 1993, with members meeting at a subdeacon’s house. The church is now in a bigger home and is hosting a jubilee celebration this weekend, including an open house Saturday with a reception attended by His Eminence, Metropolitan Joseph, Archbishop of New York and Metropolitan of All North America. Ater its time at the YMCA, St. Ignatius of Antioch Orthodox Christian Church had a home on Addison Avenue and was there for 19 years. The church sat about 50 members — a challenge during busy services where 70 people stood shoulder to shoulder. In 2014, St. Ignatius of Antioch Orthodox Christian Church bought a half-acre lot near its Addison site, but later found property on Morrison Street in Twin Falls that would provide more space for the growing church. The church moved in 2016 into the building at 181 Morrison St.
Mary Lou Panatopoulos has been a member since the church’s inception in 1993. Panatopoulos joined the church because of her husband. It was his greatest gift to her, she said. She is on the parish council and serves as the secretary. “We’ve doubled in size these 25 years. Our roots are deep. We’ve worked hard to sustain,” Panatopoulos said. “It’s a big deal, most communities this size wouldn’t be able to maintain a church like this,” Habib said. “For many people, the church is their family. An open house will be held from 11 a.m. to 1 p.m. Saturday with a reception attended by His Eminence, Metropolitan Joseph, Archbishop of New York and Metropolitan of All North America, followed by a service at 5 p.m.
A liturgy will be held 9 a.m. Sunday to ordain church member Steven Beck as a deacon, followed by a banquet at 1 p.m.
Beck's first liturgy will be at 9 a.m. Dec. 17. TWIN FALLS — The worship space of St. Ignatius of Antioch Orthodox Christian Church will more than double in size next weekend.